We provide any imaginable facade element out of these 3 materials: wall panels, columns, balustrades, crown, sills, surrounds, etc. Glass Fiber Reinforced Concrete (GFRC) Architectural Cornice is manufactured to simulate natural stone. The product comes prefinished in an assortment of colors (virtually any color you want) that permeates throughout and many finishes that simulate a variety of natural stone textures. As with our FRP products this line is made specific to each project, which is not to say that we don’t offer standard profiles. Our advanced tooling manufacturing process allows for custom profiles to cost about the same as standard profiles. The in-house production of molds significantly reduces end user costs and lead-times. This composite concrete product is much lighter than real stone, much stronger, less expensive, and easier to install. Like the trim products, our GFRC Columns are manufactured in sections and stacked to simulate real limestone. 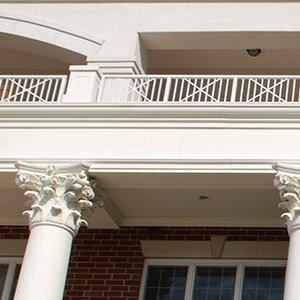 Once installed, these architectural columns are load bearing as well as structural when required. These products are generally 1-1/2” to 3” thick depending on specifications. If you have any questions, need actual product samples or color charts, or need assistance during the design phase, please feel free to contact us via email or by calling us at 877-279-9993. Architects and Designers please visit our specs/cads section for more information. 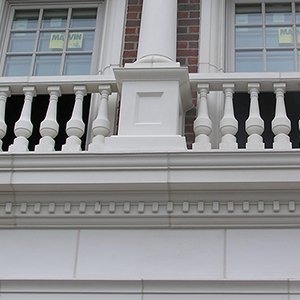 View our GFRC page for more fiber reinforced concrete products (columns, balustrades, window/door surrounds, facade elements, fireplaces). Fiberglass Reinforced Polymer or simply FRP is manufactured as a lightweight alternative to stone or concrete. With a minimum wall thickness of 3/16” our FRP moldings are the strongest and most durable in the industry. 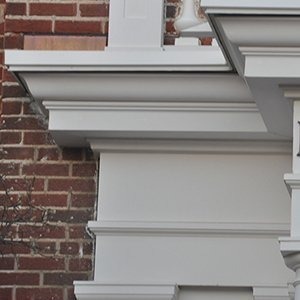 Our strong yet lightweight fiberglass cornice reduces the need for extra structural reinforcement as with stone or GFRC which saves costs on engineering, the extra structural components, and the cost of installation. We manufacture this line with a marine-grade gel coat finish to your specified color or our stone-like finish. We can ship cornice to your jobsite already pre-finished reducing your price and carbon footprint considerably. Marine-grade white gel coat finish is our standard finish. Architectural Mall’s ability to reproduce simple to complex configurations allows the Architect or Designer the freedom to recreate historical shapes & finishes without sacrificing authenticity. Most of our projects are manufactured to the exact drawings/shapes as what the Architect or Designer draws but we offer standard profiles as well (pricing for custom is in line with standard). Feel free to design what is architecturally significant to the project and we will make it happen. If you have any questions, need product samples or color charts, or need assistance during the design phase, please feel free to contact us via email or by calling us at 877-279-9993. Architects and Designers please visit our specs/cads section for more information. High Density Polyurethane is made of polyurethane foam created by mixing isocyanate and resin. The mixture is kept under pressure in a mold as it expands to the desired shape. The result is a high-density, thermoset material that is perfect for interior or exterior molding applications. Polyurethane is a wood alternative product with a closed cell structure that makes it impervious to rotting, insects, cracking, and any other negative attribute of wood. Our polyurethane moldings are shipped to your site primed twice with a durable primer ready for final paint finish. Please download our catalog for standard profiles or email us for our standard profiles as well as stock items. As with any of our products, we never shy away from custom profiles. In fact, most exterior cornice moldings are custom. If you have any questions or need assistance during the design phase, please feel free to contact us via email or by calling us at 877-279-9993. Architects and Designers please visit our specs/cads section for more information.